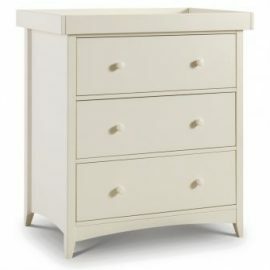 Changing Tables are an essential in any nursery or babies room. At Bigmickey.ie we have a selection of Changing Tables to suit your preferred taste and needs as a mother. Some of our Changing Tables even come with drawers for additional storage. For both style and functionality, Bigmickey.ie has everything to match your requirements and size to fit your space. The Cameo Changing Station is created in a classic Shaker style with a modern twist to suit a wide variety of Nursery settings. The Cameo Changing Station is the perfect companion to our Cameo Bedroom Collection offering a wealth of storage options to suit even the most compact of Nurseries.